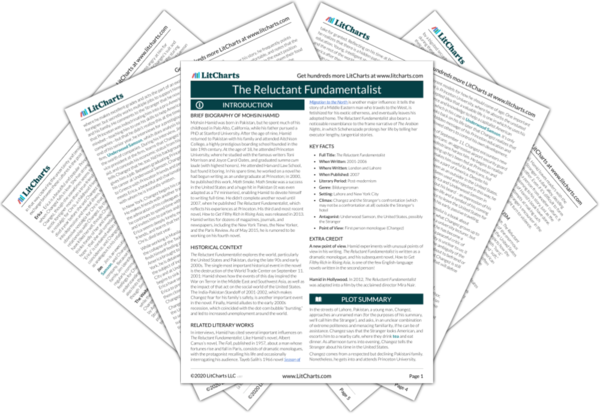 Instant downloads of all 942 LitChart PDFs (including The Reluctant Fundamentalist). 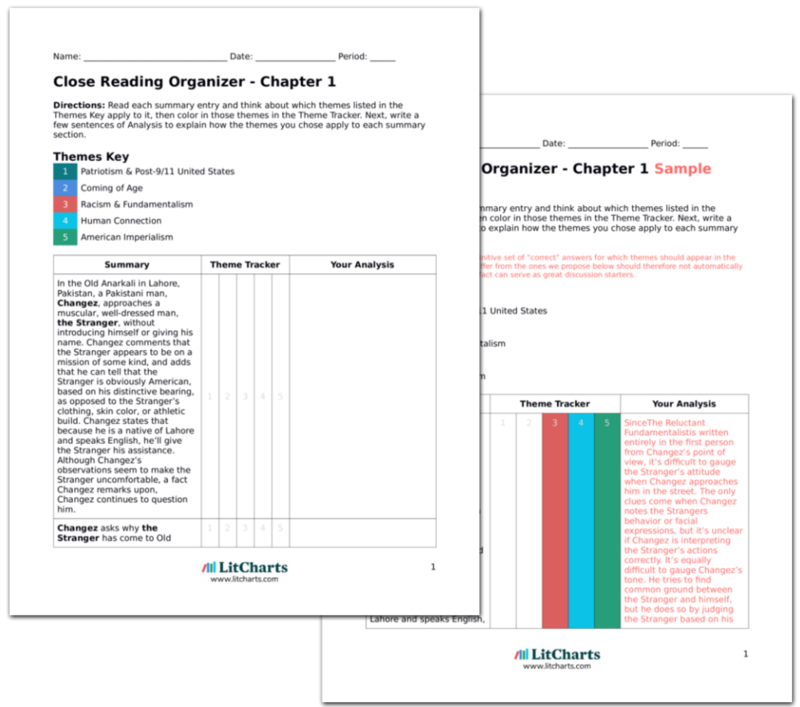 LitCharts assigns a color and icon to each theme in The Reluctant Fundamentalist, which you can use to track the themes throughout the work. Changez points out that the Stranger has a bulge under his suit, in the same place where undercover agents conceal their guns. The Stranger readjusts his position, and Changez assures him that he is sure the Stranger is carrying a travel wallet there. If one takes Changez at his word, then he thinks the Stranger is only an innocent traveler. However, Changez could also be speaking sarcastically, and be sure that the Stranger is carrying a weapon. Flying to the city of Valparaiso, Chile, Changez cannot stop thinking about Erica, but he is unable to determine why she can’t get over her love for Chris. In Chile, he meets Juan-Batista, the president of the publishing agency Underwood Samson is valuing. Changez likes Juan-Batista immediately, and compares him to a grandfather. Juan-Batista, who technically doesn’t own his publishing company and dislikes Underwood Samson, asks Jim and Changez what they know of books. Jim responds that he has valued media companies for two decades; Changez says that his father’s uncle was a poet, and he loves books. Juan-Batista dismisses Jim’s answer, but takes notice of Changez. Changez immediately likes Juan-Batista, prefiguring his role as a mentor figure to Changez. Juan-Batista also judges Changez and Jim for non-business reasons: instead of “focusing on the fundamentals,” he wants to know personal information about his colleagues. Juan-Batista seems to feel a connection with Changez, through humanist or artistic interests that the American capitalist Jim can’t fathom. Jim returns to America, leaving Changez to work in Chile with another Underwood Samson vice president. Yet while Changez should be working for Underwood Samson, he instead watches news about Pakistan. He tells the Stranger that America, though it could have told India not to attack Pakistan, an American ally, pursued a policy of neutrality that allowed India to devastate Pakistan. Changez is also distracted by the city of Valparaiso, which reminds him of Lahore. Changez criticizes American foreign policy, and seems to hold the Stranger accountable for some of Pakistan’s losses during its conflict with India. In Chile, Changez sense of connection to Valparaiso occurs even as he feels less connected to New York. The things Changez values seem to overlap less and less with what American values or represents. Changez begins to fall behind on his work. His supervisor angrily tells him to improve his work, and Changez replies that he will. Nevertheless, Changez finds it impossible to concentrate on work when there are so many emotional and political distractions. After being instructed to focus on the fundamentals, Changez finally begins to fight against his training and pay attention to his emotions. Hamid implies that America has succeeded by encouraging its citizens to ignore their emotions, especially guilt. 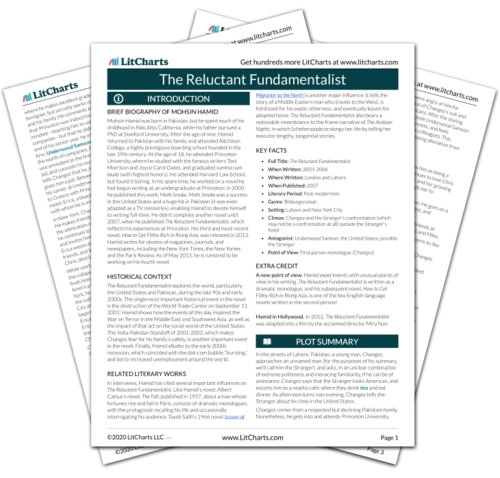 Get the entire The Reluctant Fundamentalist LitChart as a printable PDF. One day as he meets with Juan-Batista, Juan-Batista asks Changez about his father’s uncle, the poet. He notices that Changez seems unlike his colleagues, and, when Changez tells him that he likes the city of Valparaiso, suggests that Changez visit the house of Pablo Neruda, the famous poet. Juan-Batista acts the part of a mentor, encouraging Changez to make a journey, to connect with art. It’s also noteworthy that Neruda was a leftist political activist as well as an internationally renowned poet. The waiter brings a bowl of dessert, which the Stranger finds too sweet. Changez observes that the Stranger must have traveled far in order to acquire a taste for less sweet foods. Changez seems to have accumulated much information about the Stranger, even though the Stranger has refused to answer his questions directly. Changez visits Pablo Neruda’s house, which again reminds him of Lahore. While he walks around, he thinks of Erica, and realizes that he may have failed to make her love him because he lacks a “core,” since he has split his attention between Pakistan and New York. He realizes that he was willing to pretend to be Chris because he pretends to be many different things in America. He emails her these thoughts, but receives no response. Changez’s visit to Neruda’s house helps him see himself more clearly: he has divided his loyalties between Pakistan and New York. He has never established himself as himself because he has always tried to be what others wanted or expected. He sees this failure, designed to make himself attractive to Erica (and America), as ultimately self-destructive and resulting in Erica (and America, perhaps) not ever being able to see him as an equal, worthy of the respect or love. Changez calls his parents, who tell him that their home is falling apart, and that India is attacking Pakistan, possibly with America’s help. Changez’s father refuses to accept any money from Changez, but Changez sends his brother his savings. Changez tries to help his family from a distance, but with mixed results. It’s increasingly difficult for him to pretend that he is loyal to Pakistan while working for Underwood Samson, a company that strengthens America’s economic power, and therefore poses an indirect threat to Pakistan. Changez continues to fall behind at work. To the Stranger, Changez wonders aloud why his supervisor didn’t replace him, and concludes that it must be because he didn’t want to. It’s possible that Changez isn’t replaced because, as Wainwright warns, Underwood Samson wants to fire Muslims, and needs a good excuse. Juan-Batista invites Changez to lunch. At lunch, he tells Changez that he reminds him of a janissary, the name given to Christians who were kidnapped by the Ottoman Empire during the Crusades and trained to fight other Christians. He notes that janissaries were the most loyal warriors: because they fought to destroy their own civilization, they had nothing left but their adopted culture. Changez realizes that Juan-Batista is correct: he is a modern-day janissary, forced to fight against his own civilization. Changez has an epiphany here: he sees him for what he is, in the most general terms. He’s been “kidnapped” and taken to America, and then trained to strengthen America, the country that is now supporting India in its war with Pakistan. Changez says that the Stranger seems skeptical; he assures the Stranger that Juan-Batista was real, and so was their lunch. He points out that it’s unreasonable to question Changez’s honesty so late in his story. Changez’s epiphany seems to come a little quickly, and it’s possible that Changez is exaggerating it, or that his memory of it is exaggerated based on future experiences. Changez’s point that it’s too late to begin questioning his story of course does the opposite and makes the reader want to question every aspect of his story. Could much, or even all, of it have been made up? Does it matter, if the story captures something truthful about Changez’s experience? Having realized that he is fighting against his own country, Changez tells his supervisor that he refuses to work. Jim calls Changez, and offers him a break, as long as he finishes his work first. Changez feels guilty for betraying Jim, and nervous that he will lose his job and his visa, and thus may never see Erica again. Nevertheless, he leaves Chile and flies back to New York. Changez experiences a “last gasp” of loyalty to the United States. He doesn’t want to lose Jim or Erica, but ultimately, he’s more committed to his Pakistani roots. In many ways, his decision to fly away from Chile is the first and hardest decision he makes in The Reluctant Fundamentalist, signaling his growing maturity or finding of his “core”. The waiter brings green tea to Changez and the Stranger. Changez notes that it is unusual for a waiter to be watching so closely to provide such thorough service, but comments that, then again, it’s late, and they’re now alone in the café. The sinister mood is increasing as Changez’s comments again seem to suggest the Stranger’s isolation and that the behavior of the waiter may not be normal. Arn, Jackson. "The Reluctant Fundamentalist Chapter 10." LitCharts. LitCharts LLC, 18 Jun 2015. Web. 18 Apr 2019. Arn, Jackson. "The Reluctant Fundamentalist Chapter 10." LitCharts LLC, June 18, 2015. Retrieved April 18, 2019. https://www.litcharts.com/lit/the-reluctant-fundamentalist/chapter-10.